Whether you want to live on site and help visitors during our busy seasons or only have a few hours each week to volunteer, you can make a difference for Arizona State Parks and Trails! We can’t run our parks without the thousands of volunteers who selflessly give their time and talents to improve the parks for our visitors. We offer many different volunteer activities at our parks and recreation areas across the state. Check out the list of roles below for more information, and fill out a Volunteer Application today! Visitor services volunteers will assist parks in a variety of clerical and administrative functions. These could include typing, filing, park store support (inventory control and customer assistance), entry station support (fee collection, disseminating information to visitors), answering the phone, research, and other administrative duties as designated by the park manager or his/her designee. Maintenance services volunteers will assist parks with general maintenance and small construction projects. Examples include trail work, painting, plumbing, weeding, planting, or other projects as designated by the park manager or his/her designee. Volunteers will not be required to perform any extensive maintenance or repairs, especially to equipment and vehicles without supervision unless appropriate training and certifications have been documented. 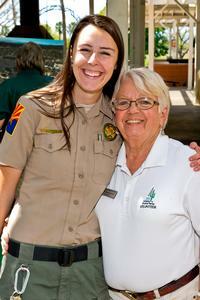 Interpretive services volunteers support an array of educational and recreational programming. These could include development and presentation of environmental programs (interpretive hikes, school presentations, etc.) historic programs (guided tours of historic houses, brown bag lunch presentations, etc.) and recreational programs (campfire talks, special demonstrations, etc.). Volunteers in this category assist with collection research and management, curation, exhibit development and installation and other appropriate projects as designated by the park manager, his/her designee and/or the ASPT curator. Volunteers in this category work primarily as field researchers, collecting data related to natural and cultural resources at our parks. In addition, volunteers assist with data recording, data management and data analysis. Special project volunteers account for individuals or groups that assist the parks in accomplishing a specific one-time project or a short-term ongoing project. These projects may include, but are not limited to: Creating interpretive displays, research, gardening, clean-up projects and trail work. Scout groups, service learning and non-paid internships typically fall into this category.